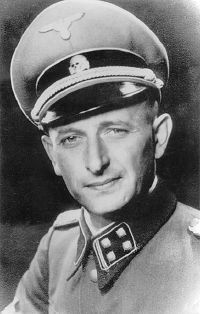 Otto Adolf Eichmann (known as Adolf Eichmann; (March 19, 1906 – June 1, 1962) was a high-ranking Nazi and SS Obersturmbannführer (Lieutenant Colonel). Due to his organizational talents and ideological reliability, he was tasked by Obergruppenführer Reinhard Heydrich to facilitate and manage the logistics of mass deportation to Ghettos in German occupied Europe 1939 – 1944 and extermination camps in Nazi-occupied Eastern Europe. He was captured by Israeli Mossad agents in Argentina and indicted by Israeli court on fifteen criminal charges, including charges of crimes against humanity and war crimes. He was convicted and hanged. Eichmann's motivations have been widely questioned as humanity has tried to understand what motivated him and others to commit these atrocities. Born in Solingen, Germany, Adolf Eichmann was the son of a businessman and industrialist, Karl Adolf Eichmann. In 1914, his family moved to Linz, Austria, after Adolf's mother died and during World War I, Eichmann's father served in the Austro-Hungarian Army. At the war's conclusion, Eichmann's father returned to the family and had a business in Linz. He left high school (Realschule) without having graduated and began a training to become a mechanic, which he also discontinued. In 1923 he started working in the mining company of his father, from 1925 to 1927 he worked as a salesclerk for the Oberösterreichische Elektrobau AG and then until Spring, 1933 Eichmann worked as district agent for the Vacuum Oil Company AG, a subsidiary of Standard Oil. In July 1933 he moved back to Germany. Eichmann married Vera Liebl on March 21, 1935. The couple had four sons: Klaus Eichmann, 1936 in Berlin, Horst Adolf Eichmann, 1940 in Vienna, Dieter Helmut Eichmann, 1942 in Prague, and Ricardo Francisco Eichmann, 1955 in Buenos Aires. On the advice of old family friend Ernst Kaltenbrunner, Eichmann joined the Austrian branch of the NSDAP (member number 889 895) and of the SS, enlisting on April 1, 1932, as an SS-Anwärter. He was accepted as a full SS member that November, appointed an SS-Mann, and assigned the SS number 45326. For the next year, Eichmann was a member of the Allgemeine-SS and served in a mustering formation operating from Salzburg. In 1933 when the Nazis came to power in Germany, Eichmann returned to that country and submitted an application to join the active duty SS regiments. 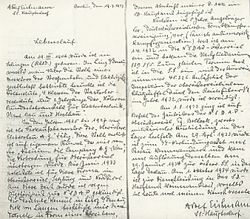 This was accepted, and in November of 1933, Eichmann was promoted to Scharführer and assigned to the administrative staff of the Dachau concentration camp. By 1934, Eichmann had chosen to make the SS a career and requested transfer into the Sicherheitspolizei (Security Police) which had, by that time, become a very powerful and feared organization. Eichmann's transfer was granted in November of 1934, and he was assigned to the headquarters of the Sicherheitsdienst (SD) in Berlin. Eichmann became a model administrator in the SD and quickly became noticed by his superiors. He was promoted to Hauptscharführer in 1935 and, in 1937, commissioned as an SS-Untersturmführer. Adolf Eichmann's "Lebenslauf" (i.e. Curriculum Vitae) for his application for promotion from SS-Hauptscharführer to SS-Untersturmführer in 1937. In 1937 Eichmann was sent to the British Mandate of Palestine with his superior Herbert Hagen to assess the possibilities of massive Jewish emigration from Germany to Palestine. They landed in Haifa but could only obtain a transit visa so they went on to Cairo. In Cairo they met Feival Polkes, an agent of the Haganah, who discussed with them the plans of the Zionists and tried to enlist their assistance in facilitating Jewish emigration from Europe. According to an answer Eichmann gave at his trial, he had also planned to meet Arab leaders in Palestine; this never happened because entry to Palestine was refused by the British authorities. Afterwards Eichmann and Hagen wrote a report recommending against large-scale emigration to Palestine for economic reasons and because it contradicted the German policy of preventing the establishment of a Jewish state there. This episode is sometimes seen as an important step towards the Nazi abandonment of emigration as the preferred solution to the "Jewish Question" (Judenfrage). In 1938, Eichmann was assigned to Austria to help organize SS Security Forces in Vienna after the Anschluss of Austria into Germany. Through this effort, Eichmann was promoted to SS-Obersturmführer (first lieutenant), and, by the end of 1938, Adolf Eichmann had been selected by the SS leadership to form the Central Office for Jewish Emigration, charged with forcibly deporting and expelling Jews from Austria. Through this work, Eichmann became a student of Judaism, even studying Hebrew. At the start of the Second World War, Eichmann had been promoted to SS-Hauptsturmführer (captain) and had made a name for himself with his Office for Jewish Emigration. Through this work Eichmann made several contacts in the Zionist movement with which he worked to speed up Jewish Emigration from the Reich. Eichmann returned to Berlin in 1939 after the formation of the Reich Central Security Office (RSHA). In December 1939, he was assigned to head RSHA Referat IV B4, the RSHA department that dealt with Jewish affairs and evacuation. In August 1940, he released his Reichssicherheitshauptamt: Madagaskar Projekt (Reich Central Security Office: Madagascar Project), a plan for forced Jewish deportation that never materialized. He was promoted to the rank of SS-Sturmbannführer in late 1940, and less than a year later to Obersturmbannführer. In 1942, Reinhard Heydrich ordered Eichmann to attend the Wannsee Conference as recording secretary, where Germany's anti-Jewish measures were set down into an official policy of genocide. To this Final Solution of the Jewish Question Eichmann was tasked as Transportation Administrator, which put him in charge of all the trains which would carry Jews to the Death Camps in the territory of occupied Poland. Eichmann's work had been noticed, and in 1944, he was sent to Hungary after Germany had occupied that country in fear of a Soviet invasion. Eichmann at once went to work deporting Jews and was able to send four hundred thousand Hungarians to their deaths in the Nazi gas chambers. By 1945 Reichsführer-SS Heinrich Himmler had ordered Jewish extermination halted and evidence of the Final Solution destroyed. Eichmann was appalled by Himmler's turnabout, and continued his work in Hungary against official orders. Eichmann was also working to avoid being called up in the last ditch German military effort, since a year before he had been commissioned as a Reserve Untersturmführer in the Waffen-SS and was now being ordered to active combat duty. Eichmann fled Hungary in 1945 as the Soviets entered, and he returned to Austria where he met up with his old friend Ernst Kaltenbrunner. Kaltenbrunner, however, refused to associate with Eichmann since Eichmann's duties as an extermination administrator had left him a marked man by the Allies. At the end of World War II, Eichmann was captured by the US Army, who did not know that this man who presented himself as "Otto Eckmann" was in fact a much bigger catch. Early in 1946, he escaped from US custody and hid in various parts of Germany for a few years. In 1948 he obtained a landing permit for Argentina, but did not use it immediately. At the beginning of 1950, Eichmann went to Italy, where he posed as a refugee named Ricardo Klement. With the help of a Franciscan friar who had connections with archbishop Alois Hudal, who organized one of the first ratlines, Eichmann obtained an International Committee of the Red Cross humanitarian passport and an Argentinian visa. He boarded a ship heading for Argentina on July 14, 1950. For the next ten years, he worked in several odd jobs in the Buenos Aires area (from factory foreman, to junior water engineer and professional rabbit farmer). Eichmann also brought his family to Argentina. In June 2006, old CIA documents regarding Nazis and stay-behind networks dedicated to anti-communist struggle were released. Among the 27,000 documents released, a March 1958 memo from the German Bundesnachrichtendienst (BND) agency to the CIA stated that Eichmann was "reported to have lived in Argentina under the alias CLEMENS since 1952." There was no action on this information, however; the government at the time, under Konrad Adenauer, was worried about what Eichmann might say, especially about the past of Hans Globke, Adenauer's national security adviser, who had worked with Eichmann in the Jewish Affairs department and helped draft the 1935 Nuremberg laws. At the request of Bonn, the CIA persuaded Life magazine to delete any reference to Globke from Eichmann's memoirs, which it had bought from his family. According to Timothy Naftali, U.S. historian at the University of Virginia, "Tragically, at the moment the CIA and the BND had this information the Israelis were temporarily giving up their search for Eichmann in Argentina because they could not figure out his alias. Throughout the 1950s, many Jews and other victims of the Holocaust dedicated themselves to finding Eichmann and other prominent Nazis. Among them was the Jewish Nazi hunter Simon Wiesenthal. In 1954, Wiesenthal's suspicions that Eichmann was in Argentina were sparked upon receiving a postcard from an associate who had moved to Buenos Aires. "I saw that dirty pig Eichmann," the letter read in part: "He lives near Buenos Aires and works for a water company." With this (and other) information collected by Wiesenthal, the Israelis had solid leads regarding Eichmann's whereabouts. Isser Harel, the then-head of the Israeli intelligence agency Mossad, however, later claimed in an unpublished manuscript that Wiesenthal "'had no role whatsoever' in Eichmann's apprehension but in fact had endangered the entire Eichmann operation and aborted the planned capture of Auschwitz doctor Josef Mengele." Also instrumental in exposing Eichmann's identity was Lothar Hermann, a worker of Jewish descent who fled to Argentina from Germany following his incarceration in the Dachau concentration camp, where Eichmann had served as an administrator. By the 1950s, Hermann had settled into life in Buenos Aires with his family; his daughter Sylvia became acquainted with the Eichmann's family and romantically involved with Klaus, the oldest Eichmann son. Due to Klaus's boastful remarks about his father's life as a Nazi and direct responsibility for the Holocaust, Hermann knew he had struck gold in 1957 after reading a newspaper report about German war criminals which included Eichmann. Soon after, he sent Sylvia to the Eichmanns' home on a fact-finding mission. She was met at the door by Eichmann himself, and after unsuccessfully asking for Klaus, she inquired as to whether she was speaking to his father. Eichmann confirmed this fact. Excited, Hermann soon began a correspondence with Fritz Bauer, chief prosecutor for the West German state of Hesse, and provided details about Eichmann's person and life. He contacted Israeli officials, who worked closely with Hermann over the next several years to learn about Eichmann and to formulate a plan to capture him. In 1960, Mossad discovered that Eichmann was in Argentina and began an effort to locate his exact whereabouts when, through relentless surveillance, it was confirmed that Ricardo Klement was, in fact, Adolf Eichmann. The Israeli government then approved an operation to capture Eichmann and bring him to Jerusalem for trial as a war criminal. Eichmann was captured by a team of Mossad and Shabak agents in a suburb of Buenos Aires on May 11, 1960, as part of a covert operation. After surveiling Eichmann for an extensive period of time, a team of Mossad agents knocked on his door under the guise of plumbers inspecting a problem in the city sewer system. Eichmann answered the door, and immediately sensed that there was something suspicious about them. Trying to delay them, Eichmann said, "One minute!." The Mossad agents kicked open the door, and team member Tzvika Maljin (Peter Malkin), a Polish Jew and a black belt in karate, knocked Eichmann unconscious with a strike to the back of his neck. The agents kept him in a safe house until it was judged that he could be taken to Israel without being detected by Argentine authorities. Disguising themselves and a heavily-sedated Eichmann as part of a delegation of Jewish union members, Eichmann was smuggled out of Argentina on board an El Al Bristol Britannia commercial air flight from Argentina to Israel on May 21. For some time the Israeli government denied involvement in Eichmann's capture, claiming that he had been taken by Jewish volunteers who eagerly turned him over to government authorities. This claim was made due to the influence of anti-Semitic sectors in the Argentinian government and military. Negotiations followed between Prime Minister David Ben Gurion and Argentinian president Arturo Frondizi, while the abduction was met from radical right sectors with a violent wave of anti-Semitism, carried on the streets by the Tacuara Nationalist Movement (including murders, torture and bombings). Ben Gurion then announced Eichmann's capture to the Knesset (Israel's parliament) on May 23, receiving a standing ovation in return. Isser Harel, head of the Mossad at the time of the operation, wrote a book about Eichmann's capture entitled The House on Garibaldi Street; some years later a member of the kidnapping team, Peter Malkin, authored Eichmann in My Hands, a book that explores Eichmann's character and motivations, but whose veracity has been attacked. In June, 1960, after unsuccessful secret negotiations with Israel, Argentina requested an urgent meeting of the United Nations Security Council, to protest the "violation of the sovereign rights of the Argentine Republic". In the ensuing debate, the Israeli representative Golda Meir argued that the incident was only an "isolated violation of Argentine law" since the abductors were not Israeli agents but private individuals. Eventually the Council passed a resolution which confirmed the illegality of the act and requested Israel "to make appropriate reparation," while stating that "this resolution should in no way be interpreted as condoning the odious crimes of which Eichmann is accused". After further negotiations, on August 3, Israel and Argentina agreed to end their dispute with a joint statement that "the Governments of Israel and the Republic of the Argentine, imbued with the wish to give effect to the resolution of the Security Council of June 23, 1960, in which the hope was expressed that the traditionally friendly relations between the two countries will be advanced, have decided to regard as closed the incident that arose out of the action taken by Israel nationals which infringed fundamental rights of the State of Argentina." In the subsequent trial and appeal, the Israeli courts avoided the issue of the legality of Eichmann's capture, relying instead on legal precedents that the circumstances of his capture had no bearing on the legality of his trial. The Israeli Court also determined that because "Argentina has condoned the violation of her sovereignty and has waived her claims, including that for the return of the Appellant, any violation of international law that may have been involved in this incident has thus been remedied". Eichmann's trial in front of an Israeli court in Jerusalem started on April 11, 1961. He was indicted on 15 criminal charges, including charges of crimes against humanity, crimes against the Jewish people and membership of an outlawed organization. As in Israeli criminal procedure, his trial was presided over by three judges : Moshe Landau (president), Benjamin Halevi and Yitzhak Raveh. Gideon Hausner, the Israeli attorney general, acted as chief prosecutor. The trial caused huge international controversy as well as an international sensation. The Israeli government allowed news programs all over the world to broadcast the trial live with few restrictions. Television viewers saw a nondescript man sitting in a bulletproof glass booth while witnesses, including many Holocaust survivors, testified against him and his role in transporting victims to the extermination camps. During the whole trial, Eichmann insisted that he was only "following orders"–the same defense used by some of the Nazi war criminals during the 1945-1946 Nuremberg Trials. He explicitly declared that he had abdicated his conscience in order to follow the Führerprinzip. This defense in time would inspire the Milgram experiment. After 14 weeks of testimony with more than 1,500 documents, 100 prosecution witnesses (90 of whom were Nazi concentration camp survivors) and dozens of defense depositions delivered by diplomatic couriers from 16 different countries, the Eichmann trial ended on August 14, where the judges were then left to deliberate. On December 11 the three judges announced their verdict: Eichmann was convicted on all counts. On December 15, he was sentenced to death. Eichmann appealed the verdict, mostly relying on legal arguments about Israel's jurisdiction and the legality of the laws under which he was charged. He also claimed that he was protected by the principle of "Acts of State" and repeated his "superior orders" defense. On May 29, 1962 Israel's Supreme Court, sitting as a Court of Criminal Appeal, rejected the appeal and upheld the District Court's judgment on all counts. On May 31, Israeli president Itzhak Ben-Zvi turned down Eichmann's petition for mercy. A large number of prominent persons sent requests for clemency. Ben-Zvi replied quoting a passage from the Book of Samuel: "As your sword bereaved women, so will your mother be bereaved among women." (Samuel 1:15:33, Samuel's words to Agag king of the Amalekites). Eichmann was hanged a few minutes after midnight on June 1, 1962, at Ramla prison. This remains the only civil execution ever carried out in Israel, which has a general policy of not using the death penalty. Eichmann allegedly refused a last meal, preferring instead a bottle of Carmel, a dry red Israeli wine. He consumed about half of the bottle. He also refused to don the traditional black hood for his execution. According to an official account, there were supposedly two people who would pull the lever simultaneously, so neither would know for sure by whose hand Eichmann died. Eichmann's last words were, reportedly: "Long live Germany. Long live Austria. Long live Argentina. These are the countries with which I have been most closely associated and I shall not forget them. I had to obey the rules of war and my flag. I am ready." Shortly after the execution Eichmann's body was cremated. The next morning his ashes were scattered at sea over the Mediterranean, in international waters. This was to ensure that there could be no future memorial and that no nation would serve as Adolf Eichmann's final resting place. Since Eichmann's death, historians have speculated on certain facts regarding his life. The most important question is how responsible Eichmann was for the implementation of the Holocaust. Most agree that Eichmann knew exactly what he was doing; however, some "Eichmann Defenders" (his son included) state that he was unfairly judged and that he was only doing his duty as a soldier. According to his own admission he joined the SS, not because he agreed or disagreed with its ethos, but because, like the careerist that he was, he simply needed an institution that would enable him to get on. A third—and highly controversial&nmdash;analysis came from political theorist Hannah Arendt, a Jew who fled Germany before Hitler's rise, and who reported on Eichmann's trial for The New Yorker magazine. In Eichmann in Jerusalem, a book formed by this reporting, Arendt concluded that, aside from a desire for improving his career, Eichmann showed no trace of anti-Semitism or psychological damage. She called him the embodiment of the "banality of evil," as he appeared at his trial to have an ordinary and common personality, displaying neither guilt nor hatred. She suggested that this most strikingly discredits the idea that the Nazi criminals were manifestly psychopathic and different from ordinary people. Many concluded from this and similar observations that even the most ordinary of people can commit horrendous crimes if placed in the right situation, and given the correct incentives, but Arendt disagreed with this interpretation. Stanley Milgram suggested exactly that when he wrote "I must conclude that Arendt's conception of the banality of evil comes closer to the truth than one might dare imagine." However, Arendt was not stating that Eichmann was normal and that any person placed in his situation would have done the same. Quite to the contrary, according to her account, Adolf Eichmann had abdicated his will to make moral choices, and thus his autonomy, which is the foundation of humanity and of living in society. Eichmann claimed he was just following orders, and that he was therefore respecting the duties of a "bureaucrat." But Arendt argued that he had essentially forsaken the conditions of morality, autonomy and the possibility to question orders. Eichmann had stopped thinking for himself, following as law all the Führer 's orders (the Führerprinzip). ↑ Peter Krause, Der Eichmann-Prozess in der deutschen Presse The Eichmann trial in the German press (Frankfurt: Campus press, 2002, ISBN 3593370018), 20. ↑ Scott Shane, "C.I.A. Knew Where Eichmann Was Hiding." New York Times, June 7, 2006. Retrieved February 28, 2007. ↑ ""Documents show post-war CIA covered up Nazi war crimes"", Haaretz.com, 2006-06-07. Retrieved June 11, 2006. ↑ 5.0 5.1 Christopher Lee, "CIA Ties With Ex-Nazis Shown" The Washington Post, June 7, 2006. Retrieved May 20, 2013. ↑ Jonathan Schachter, "Isser Harel Takes On Nazi-Hunter. Wiesenthal 'Had No Role' In Eichmann Kidnapping." The Jerusalem Post, May 7, 1991. ↑ Haggai Hitron, "The monster is in handcuffs" Haaretz, January 16, 2007. Retrieved September 7, 2007. ↑ "Tacuara salió a la calle," May 15, 2005. Retrieved September 7, 2007. ↑ 9.0 9.1 M. Lippmann, "The trial of Adolf Eichmann and the protection of universal human rights under international law." Houston Journal of International Law, (Autumn 1982): 1-34. ↑ Security Council resolution 138, June 23, 1960 (Symbol S/4349). Retrieved August 14, 2007. ↑ L. C. Green, "Legal issues of the Eichmann trial." Tulane Law Review 641 (1962-1963):643-683. ↑ Eichmann trial transcript and appeal transcript. Retrieved September 7, 2007. ↑ "Israeli letters favored sparing of Eichmann." New York Times, June 4, 1962. Retrieved August 14, 2007. ↑ Yoseph Carmel, Itzchak Ben Zvi from his Diary in the President's office, Mesada: Ramat Gan, (1967):179. Retrieved August 14, 2007. ↑ The Executioner Retrieved August 14, 2007. ↑ "Eichmann memoirs published", Guardian Unlimited, 1999-08-12. Retrieved March 23, 2006. ↑ Stanley Milgram, "The Perils of Obedience," Harper's Magazine, 1974. ↑ David Cesarani, Becoming Eichmann: Rethinking the Life, Crimes and Trial of a ‘Desk Murderer’ (Cambridge, MA: Da Capo Press, 2006), 197–347. Pearlman, Moshe. The Capture of Adolf Eichmann, 1961. (cited in Hannah Arendt's book Eichmann in Jerusalem), 235. CIA papers: U.S. failed to pursue Nazi War Criminal Adolf Eichmann. The Capture of Adolf Eichmann from the Jewish Virtual Library. Declassified CIA names file on Adolf Eichmann - Provided by the National Security Archive. Eichmann trial: The complete transcripts - Provided by the Nizkor Project. Postwar Germany, the Vatican and CIA shielded Eichmann - World Socialist Web Site. This page was last modified on 1 February 2019, at 20:59.